guys, i just ran acrossed something that is kind of interesting. this chemical reaction is Solid Zinc with copper sulphate, that will turn into Zinc Sulphate. could it be possible to do a Zinc plating with nothing more than using a Zinc anode in our baths? zink could produce a nice Silver looking shine to bullets. go 90% copper plate, then swich to Zinc for the last .0005.. wala Shinny Bullets. anyways.. i was going to give this a try.. it cought my attention. also, if zinc will act like this in a sulphate solution, then what about Nickel?! or Silver?! i heated some distilled water up in the microwave.. almost to the point of boiling. then dissolved copper sulphate until it would not dissove any more.. strained out the remaining crystals with a coffee filter. added 2 large chunks of zinc to about 30 mills of copper sulfate solution. in seconds, copper deposits began to form on the zinc chunks. 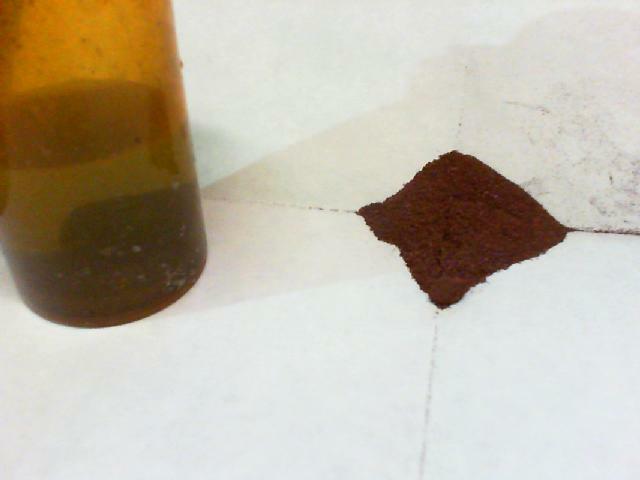 after about ah hour or less, i ended up with almost a teaspoon of copper flakes. strained the copper out with another coffee filter. the zinc chunks where coated with a blackish film and lots of copper flakes.. i brushed this film off of the zinc with a rag then used a green scruby to bring them back to shine. replaced them back into the strained solution. now very little copper flakes are forming.. almost none at all.. i'm assuming the chemical reaction is complete at this point. now to try and do a little plating to see if it plates zinc or not. i used my small bath method, wrapped the positive lead to a zinc chunk, then connected a brass case to the negitive side.. dipped it into the small bath for a little while, then removed it.. used a little polish and polished it out..
the result, A NICKEL looking case!!! this is how much copper i got from just this small amount of copper sulfate solution. the container is a small perscription pill container about half full with the solution. note: this reaction of replacing the copper in the copper solfate solution doesn't seem to happen with Nickel or Silver. i made up 2 other containers of the copper sulfate solution, and added a silver 50 cent piece to one, and a nickel coin to the other. neither is showing any sort of reaction.. unlike the zinc where the zinc had an immediate reaction. Bummer! oh well.. still kinda cool..
one day, i'll figure out how to easily make a nickel or silver solfate solution for plating..
but in the mean time, Zinc looks pretty damn good..
btw - the Zinc chunks where made from newer pennies. i melted 10 of them down, then poured the molten zinc into a 45 mold, and made 45 zinc bullets. i then treated the zinc bullets as zinc chunks in the above expierement. 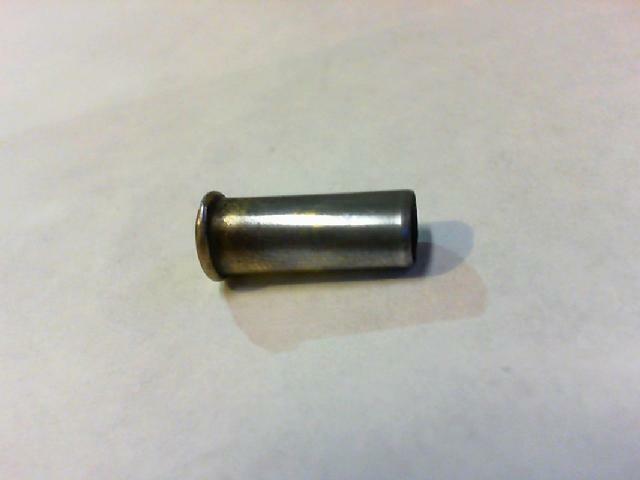 the zinc bullets where from a previous experement that i did trying to find an alternative to lead bullets. a 200 grain lead mold resulted in a 135 grain zinc bullet. i never fired the zinc bullets.. for i couldn't find any other instance where someone had fired a pure zinc bullet before.. so i didn't want to risk destroying my barrel.. if all hell breaks loose, and i have no other choice, then i would give it a try.. until then, i wont do it until i have proof that it wont hurt anything. First off Zinc is use almost exclusively as a corrosion magnet per say Because Zinc is very electrochemically active. It has been used in the Marine environment for that very reason I would like to say for centuries but I know for over the last one or two. LOL any way I don't think from a reactive standpoint there is any reason that if zinc is in the equation plating will stick to anything other than the zinc. JMO. As far as electroplating other metals look up Dalic and Selectron they have been the industrial electroplating companies for the last half century or so. When I was in the Navy we did a lot of Dalic electro-plating and there were certain metals we had to put down first to supply a sub-strait for others to adhere to. note : Do not add hydrocloric acid to zink sulfate. it does not act like copper sulfate and hydrocloric acid. it actualy ends up creating hydrogen out of the water. though, it may be an interesting hydrogen source for those hydrogen cell guys on youtube.. but in any case, it doesn't plate at all once you add hydrocloric acid. Reload3006 wrote: First off Zinc is use almost exclusively as a corrosion magnet per say Because Zinc is very electrochemically active. It has been used in the Marine environment for that very reason I would like to say for centuries but I know for over the last one or two. LOL any way I don't think from a reactive standpoint there is any reason that if zinc is in the equation plating will stick to anything other than the zinc. JMO. As far as electroplating other metals look up Dalic and Selectron they have been the industrial electroplating companies for the last half century or so. When I was in the Navy we did a lot of Dalic electro-plating and there were certain metals we had to put down first to supply a sub-strait for others to adhere to. corrosion magnet? dont you mean the oppisate? ever hear of zinc plated nails? they plate zink onto many things to prevent corrosion. i seemed to have plated brass pretty well.. shined up really good and no problems of it comming off.. though, i have seen copper come off much easier from a light plate like this. i would suppose plating zinc onto certian metals, it would cause a problem though. like zinc and copper, the two in the presents of light acids do create batteries. have yea ever sucked on copper bb's before then tossed in a zinc plated one? lol.. feels like a 9v battery hitting your toung. No I mean exactly what I said. Zink anodes are put on ships to attract corrosion. I guess that answers my question because that's what Dykem is used for. Dan...I meant to ask you...how long does it take by your method, using Root Killer, to build up a .001" layer? Bluehawk wrote: Dan...I meant to ask you...how long does it take by your method, using Root Killer, to build up a .001" layer? using the chemical plating method, it doesn't take long at all. if i use a paint brush, it takes about 4 strokes. if i tie something onto it like a string, it takes about 4 quick dips into the solution. but this also depends on the strength of the copper sulfate solution. if you heat the distilled water to boil, then add copper sulfate until it wont dissolve any more.. then bring the solution to a boil a second time then try and dissolve more until it will no longer dissolve. then allow it to cool to room temp before adding the battery acid! remember to allow it to COOL FIRST. sulferic acid is MOST active when its HOT. so adding it to a HOT liquid will make things really really corrosive. only add a fiew drops at a time, add a fiew drops, brush some onto a test piece.. if it plates, then your solution is good.. if it doesn't add a fiew more and try agian. if you add to much battery acid, it will make the plate turn BLACK. if this happens add some distilled water to dilute it down until it no longer does this. this should make it so you can plate things quickly, and easily without electricity. Reload3006 wrote: No I mean exactly what I said. Zink anodes are put on ships to attract corrosion. oooh.. the sacrificial method of maintaining steelwork while in saltwater. yea, now i remember. this is done on Piers as well. but, this does not apply to zinc coated objects exposted to normal elements. check out some stuff on google about zinc coated products. here is what one said..
Zinc metal has a number of characteristics that make it well suited for use as a coating for protecting iron and steel products from corrosion. Its excellent corrosion resistance in most environments accounts for its successful use as a protective coating on a variety of products and in many exposure conditions. The excellent field performance of zinc coatings results from their ability to form dense, adherent corrosion product films and a rate of corrosion considerably below that of ferrous materials, some 10 to 100 times slower, depending upon the environment. While a fresh zinc surface is quite reactive when exposed to the atmosphere, a thin film of corrosion products develops rapidly, greatly reducing the rate of further corrosion. Click the link above to view a chart depicting the expected service life to first maintenance (5% red rust) of iron and steel based on the zinc coating thickness and the environment. 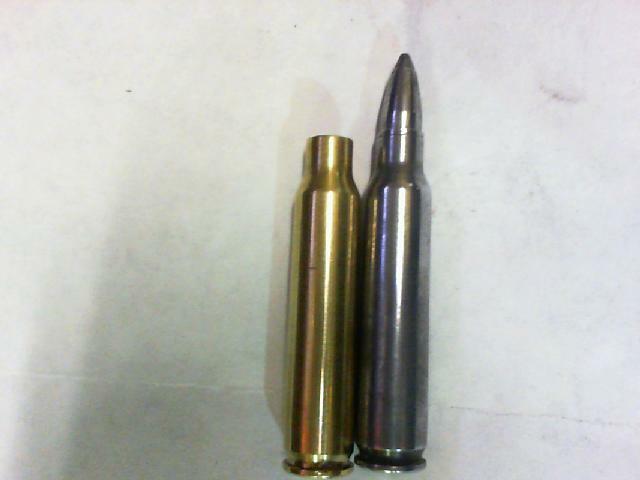 well.. i decided to zinc plate a 223 case and a 223 bullet. boy does it look like steel! i tried plating a Lead bullet. go figure, you cant even tell its plated by looking at it.. lol. but, if you try and scratch it with your finger nail, you can scratch lead easily, where zinc plated lead bullet cannot be scratched. i also found in the latest midway flyier, that HSM copper plated bullets are only plated with .0005 thick of a plate. so, i noticed in the latest midway flyer that HSM factory plated bullets are plated with .0005 of copper.. man, thats a thin plate.. but still shows that even a small plate like that can prevent leading of a non-lubed bullet. .001 of zinc should do just as good, if not better.. or even .001 of copper would be just as good if not better than most factory plates. Where exactly is it used on aircraft? I'm a pilot and licensed aircraft mechanic and I've never come across any sacrificial zinc. I could be wrong...perhaps it was hiding in the cargo hold?? Zinc washers can be used between a steel bolt/screw (etc.,) and aluminum parts to avoid dis-similar metal corrosion but you won't find them all over the plane. Aluminum rivets are what are used to hold most of the aircraft together. I work for McDonnell Douglas part of the Boeing Co now. I can tell you on the F/A18 the F-15E AV8B and Apache there are zinc anodes all over it in the fuselage the wings the ailerons the gear. I am too an A&P, IA and certified on all Boeing commercial class airliners from 707 to 787 as well as MD80, MD82. Zinc sacrificial anodes are all over all the planes not only where reload all ready stated but also the fuel tanks have a sacrificial anode in them, as well as the E&E bays. kinda full circle people started flying with dope and fabric and went aluminum now we are going back to just a harder dope and fabric in composites. what do you gain from this??? seems like alot of unneccesory work!! dartfreak75 wrote: what do you gain from this??? seems like alot of unneccesory work!! however, doing ANY kind of plate over lead prevents leading. either copper or zinc. brass is an alloy that is made of both copper and zinc.. so adding zinc to the outside of brass only changes its appearance. some people perferr nickel plated cases, zinc offers the same luster as nickel, and it shines up really well. actualy, its not that much more preperation of the bullets. its about the same as doing Pan lubing. the solution takes longer to prep than anything else.. but once you make up a bach of solution, you can use that same batch of solution for lots and lots of bullets. DanRickard wrote: actualy, its not that much more preperation of the bullets. Neat idea Dan....A good use for those evil Zinc wheel weights? just be careful melting these babies back down after being plated with zinc....stay below the melting point of zinc and it should be fine. This Zinc idea has me piqued I have been doing a lot of reading I think Dan may really be on to something. Seems like Zinc has been a bullet material for a long long time. I read where a guy at Remington arms patented zinc bullets and was saying that they could be just swaged into shape. IF some one wants to try this out I would be willing to risk my dies and swage some if some one wants to risk their barrels LOL I cant find it but I read somewhere that Zinc can leave pretty nasty "Leading" or i guess you should say "zinking" that was very difficult to get out. That is also my worry about using a material akin to aluminum I know all the talk about aluminum oxide but being a machinist I have seen how easily it galls up your cutters etc I could only imagine what that would be like trying to get out of a bore. zinc has a melting point of 787 degrees F.
copper has a melting point of 1984 degrees F.
so, it may be possible to melt the zinc while going through your barrel. right now, i've been playing with Zinc more to Coat Casings, than bullets. though, it seems MUCH easier to Plate Zinc than Copper.. copper tends to not stick very well to lead or brass.. where Zinc seems to stick MUCH better. its so much better, that i can plate a light plate of .0001, then use my Buffing wheel on my grinder to polish it out. where i really couldn't do this with a copper plate unless it was a really thick plate.. and even then there was a great risk of flaking off. i've done about a dozzen plates on cases and lead bullets, and zinc has yet to flake at all.